Правда Feb17th 1942 “Heroes of the Soviet People have today liberated the city of Kursk from the fascist invader. Our glorious cavalrymen of the 1st Guards Cavalry Corp drove the Fascists from the city and were welcomed by throngs of grateful citizens who lined the streets greeting their liberators. Other forces driving south from Leningrad have advanced another 50 miles today and in the far north another enemy division has been annihilated and Kandalaksha is liberated! Pyotr Pospelov – editor in chief. Finland; The belated Soviet response to the German and Finish attacks across the border start to bear fruit as the isolated 7-6 German infantry division is cadred at Kandalaksha and the flanks of the drive north are secured. The race is now on to see if Murmansk can be liberated before the German forces can seize the city. In the south the loss of 10th Mech places the troops north of the lakes into a defensive posture. Leningrad Front; The drive south continues with two attacks directly south and one westward to open up the German flanks. 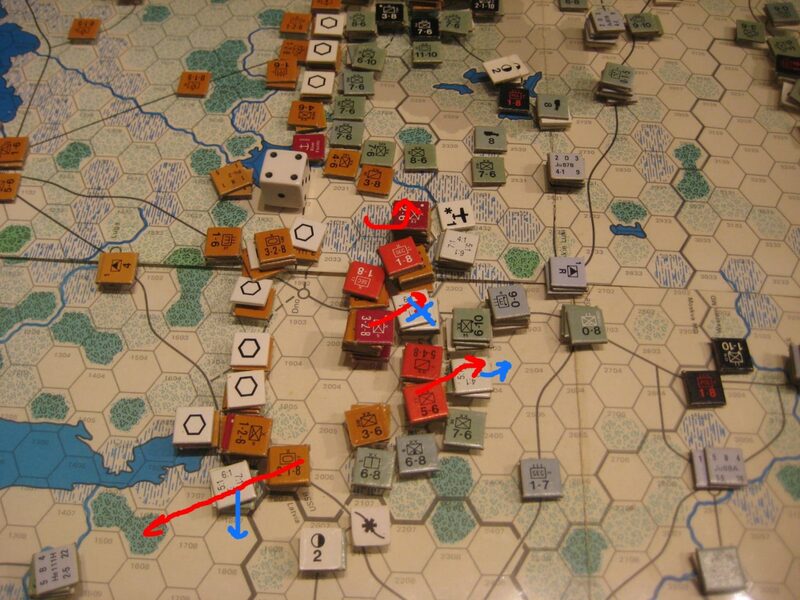 Here light tank brigades exploit west while the main thrust reaches within 2 hexes of the main Axis arterial railroad through Veliki Luki. East of Kalinin troops rush to cover the gaping hole left by the city’s collapse. A line is formed by stretching from both flanks and a scratch force of engineers, tank battalions and other troops en-route to the front elsewhere. Two Tank divisions pulled out of the line are rushed to the gap and take up a blocking position in front of the expected route of the Panzers. 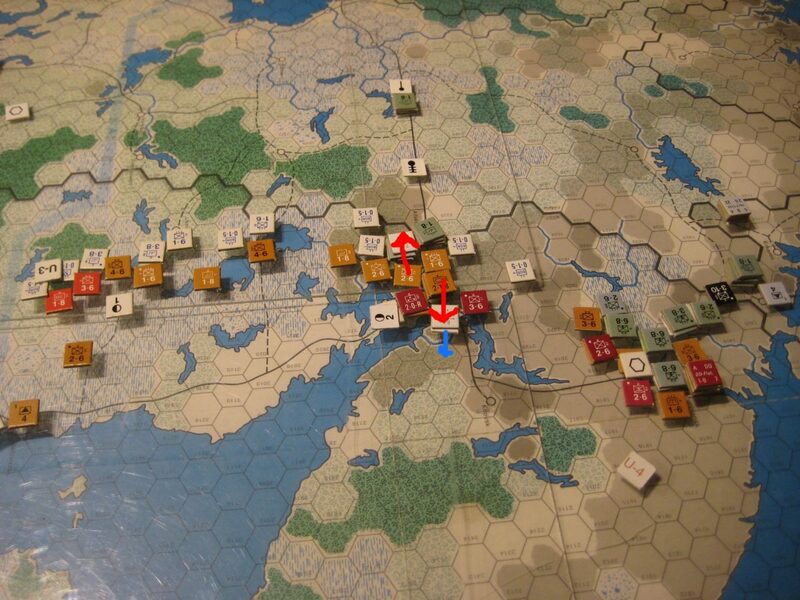 Moscow Front; The Soviet response to the loss of the centre of Moscow takes advantage of the Germans need to thin the line to mass for that attack and they attack the easternmost German fort and cadre SS Totenkopf relieving the pressure on the north-eastern Soviet owned Moscow hex. 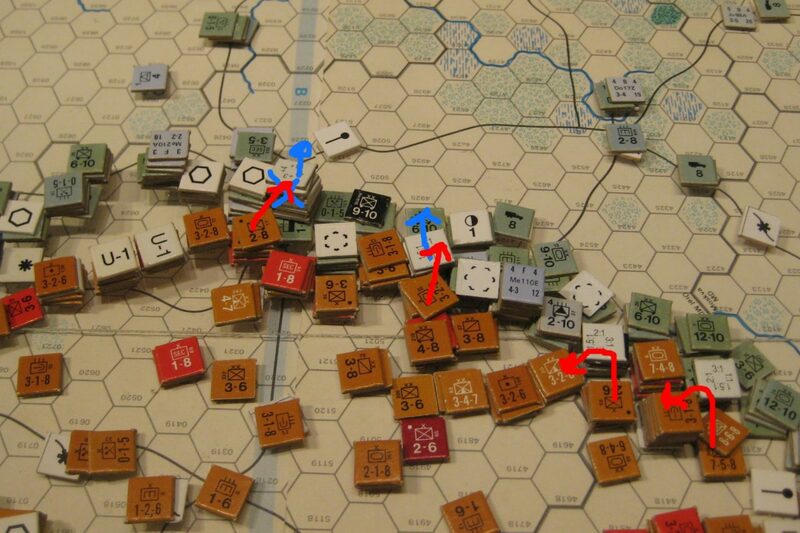 Voronezh Front; The main attack westward stalls with two NEs, one DR and a single successful HX but fortunately this latter is against Kursk which is recaptured. Rostov Front & the Crimea: The Soviets reluctantly make the decision to withdraw the battered remnants of the black sea fleet to Poti in the South Caucuses out of harm’s way of the Luftwaffe. This leaves Odessa and Sevastopol in a U4 condition and effectively heralds their imminent collapse but with just three (two damaged) capital ships left they have no choice and deem it best to maintain a minimal amphibious capability for the future. Air War; As many soviets aircraft as possible cover the scattered defenders of the Kalinin gap with DAS. Elsewhere a few entirely ineffective raids produce no appreciable results.